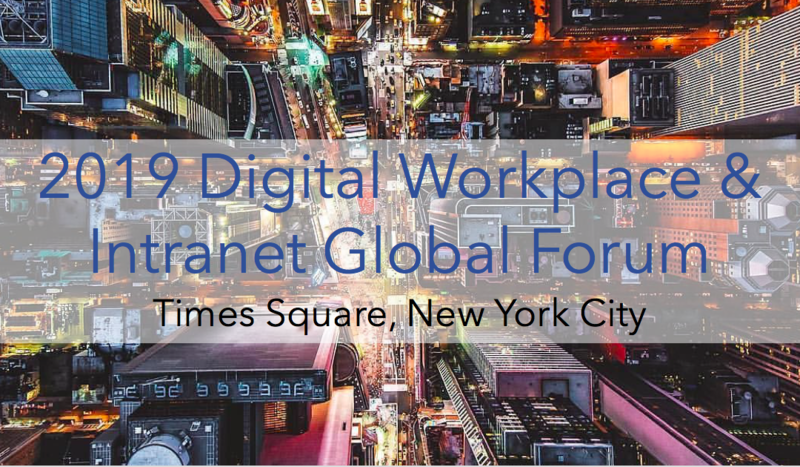 The Early-Bird Rate is open for the 2019 Digital Workplace & Intranet Global Forum at Times Square, New York – Nov. 19 & 20. Now two full days with a half-day workshop on Intranet Planning & Governance on Day two. The 2019 Digital Workplace & Intranet Global Forum is the 11th Annual digital workplace conference, North America’s leading dedicated conference on the digital workplace, with a specialized focus on the design, governance and management of enterprise intranets and social intranets. The Digital Workplace & Intranet Global Forum provides intranet executives and managers in communications, IT and HR with all the tools they need to understand the recent changes, and the fundamental skills for designing, deploying and governing a new era intranet and the greater digital workplace.